Come create a beautiful Grapevine Wreath for your front door! 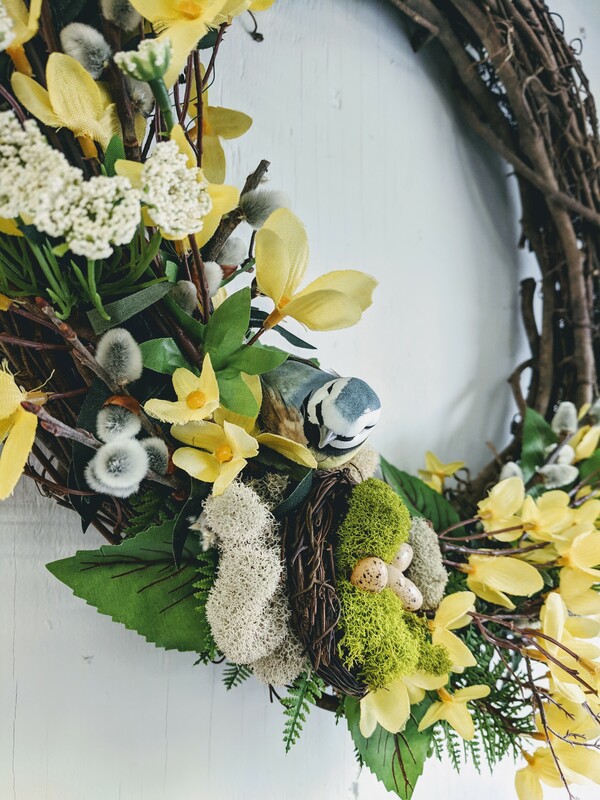 Create a Spring Wreath using faux plants and foliage on a nice grapevine wreath. Beautiful yellow Forsythia steals the show and lets everyone know that Spring Is Finally Here! Easy to build and use year after year makes this a great craft to enjoy for a long time. Enjoy hand-crafted cider at the Grisamore Cider Works. Feel free to bring your own snacks, but please no outside beverages. What’s Included: Grapevine Wreath, Faux Plants/Foliage, Florist Wire, Clippers, Ribbon, Design Instruction, Aprons/Gloves. What to Bring: Camera, Comfortable Shoes. Any food or beverages must be purchased at the venue only – no outside snacks or drinks may be brought in. Help us support our wonderful local venues for letting us host our garden-inspired crafts at their place of business!